How exciting to see Festive Fireworks on the cover of the July 2017 issue of Needle Pointers!! I knew it was getting published but not that it would be on the cover. I worked with Pam G. again to create the final charts and diagrams. I gave her my hand written charts, diagrams, and instructions to transform them and she did a great job! This piece started with a group who encourage each other to design a piece based on a particular theme & this was to be something that “expressed a celebration”. And, being from Philadelphia, I immediately thought of all the wonderful fireworks especially the ones for the 4th of July. And, I’ve often thought that stitch patterns in Jean Hilton’s books remind me of fireworks and I used Stimulating Stitches and Needlepoint Stitches for most of the stitches. Since we have fireworks several times during the year, I created a main motif of the center star surrounded by a border of Symrna stitches and corner crescents while the smaller side motifs are different in each of the designs resembling a variety of fireworks. When I found the red, white, and blue Silk Lamé Braid, I literally jumped for joy! The 5 points of the center star are intended to serve as a guide for counting throughout the piece. Stitches used are: Crescents, Smyrna stitches, Jessica stitches, Wrapped coils, Double Fans, Plaited Ray, and Wrapped Sheaf. Everything was diagrammed before stitching. Since there is exposed canvas, I took care so that threads do not show through. I was too shocked to jump for joy when I saw the blue ribbon! First place in non-professional original design at the 2016 ANG Seminar! We were allowed to get photos after the exhibit closed & as long as no other piece could be seen. Another benefit of volunteering – behind the scenes access. 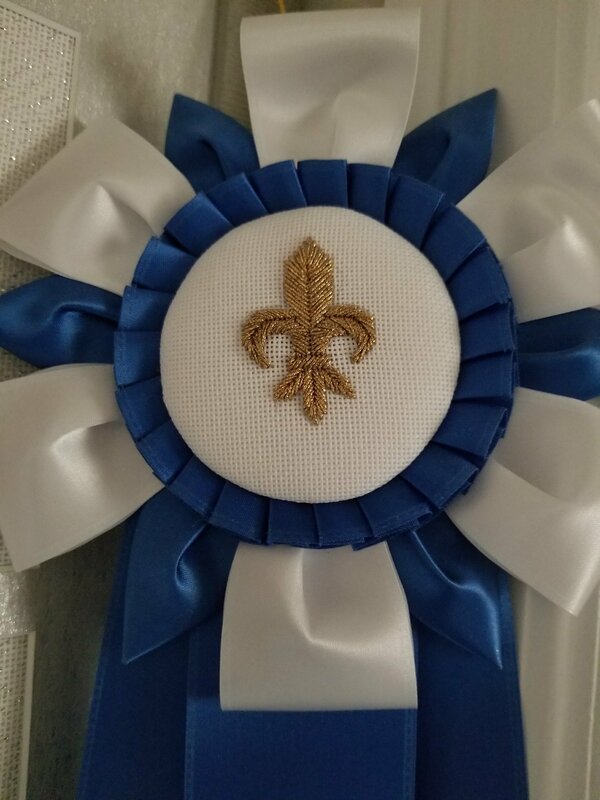 The First Place and special award ribbons are beautifully hand stitched and this one was done by Elena L. from the local New Orleans chapter. Thanks to all the volunteers for your efforts – the seminar was fantastic. I stitched the stars as 3 separate pieces (as seen on the cover) but then framed them as a single vertical set. It measures approximately 11″ x 23″, is stitched on 18 count monocanvas, and used Fyre Werks, Silk Lamé Braid For 18 count, Kreinik #4 Braid, Crystal Braid, Soie Cristale, and Dinky Dyes.